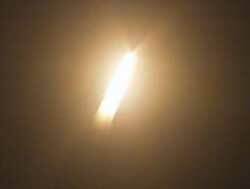 The U.S. Air Force and Orbital Sciences launched the maiden OSP Minotaur rocket at 0303 GMT on January 27 from Vandenberg Air Force Base. Images: Spaceflight Now. Workers remove a protective shielding so the mobile service gantry can be retracted into the launch position. The OSP Minotaur was enclosed in the tower during its stay on the pad. The OSP Minotaur, powered by leftover Minuteman 2 ICBM missile and Pegasus rocket stages, zooms off the launch pad in the blink of an eye. 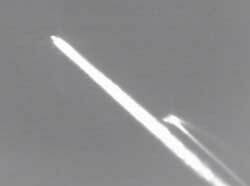 The fiery comet-like streak from the rocket was seen throughout the southwestern U.S.
An infrared tracking camera captured this dramatic view of the rocket's first stage falling away as the second stage powers the vehicle toward space. Launch site: CLF, Vandenberg Air Force Base, Calif. 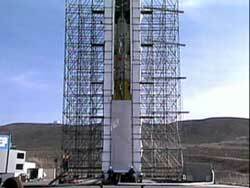 The inaugural OSP Minotaur rocket blasts off from pad at Vandenberg Air Force Base, California. 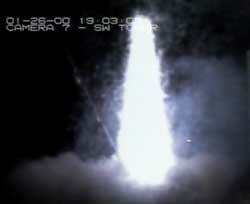 The rocket's second stage ignites and the first stage is jettisoned as seen by infrared camera.